Virtual Reality is going to be the next leap forward in gaming and computer use. Impressive virtual reality simulators are already here, and although they’re not cheap, if you’ve had the opportunity to use either the Oculus Rift, or the HTC Vive, then you know just how impressive they can be. VR technology for phones is developing rapidly. But isn’t quite at the same level yet. However, it’s much cheaper than console alternatives. And can give you a great introduction to the joys of virtual reality. This week we’ve been looking at VR Headsets. There are plenty of options for Android users, but as many of us have iPhones, we wanted to know which headset was the best for IOS. 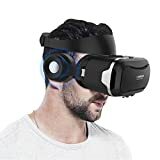 We went through pretty much every iPhone compatible headset, the technology is still in its infancy, but right now the best VR Headset you can get for the iPhone is the Merge VR. In this article, we’ll talk about what we liked about the Merge, we’ll also discuss the other iPhone-compatible headsets we looked at. Some of which were very good. As technology reviewers, we’ve all got a serious interest in virtual reality. Particularly as it’s rightly seen as the future of gaming and probably computing in general. But although we’d dabbled with some of the desktop virtual reality systems. Only one of us had ever previously used a phone-based VR product. And that was for the Android. So it’s safe to say we didn’t have the most experience in this specific niche. To remedy this, we decided to survey groups of mobile phone gamers. We specifically sought out iPhone users who were interested in, and had used virtual reality headsets. Because we didn’t have much experience, we needed to find out from them what features are important to consider when looking for a good headset. We needed to know which things are absolutely essential for your headset to have, and which might be nice additions. But aren’t 100% necessary. After much discussion, they gave us this list of the things they consider to be most important. We determined this final list by taking all the headsets that didn’t fit the above criteria and excluding them. After that, we got hold of all the remaining headsets that did fit the criteria. We then tested them. Our top 5 headsets are the models that overall, performed the best in testing. One of the keys to good virtual reality, is immersion. Immersion is that feeling of being right there. Of being ‘inside’ whichever movie you’re watching or game you’re playing. It’s the difference between seeing a movie on a big screen. And seeing it like it’s just you and the actors. Like they’re putting on a private performance just for you. This is the thing that gets people really excited about virtual reality. Even now when it’s in its infancy. One of the most crucial things to guarantee immersion, is that the headset you’re wearing fits well. I mean, you’re hardly going to feel like your right inside a film, if you have to keep adjusting the headset because it keeps sliding down your face. The users we spoke to said that a common complaint with VR Headsets is they often don’t fit well. We’re not talking about comfort (we’ll get to that in a minute). Instead we’re talking about how well the headset stays in one place for a prolonged period of time. The reason this is such an issue is because headsets are designed to be hands-free. The whole point is that you can strap them to your face, throw on your favorite series, and collapse into the couch exactly as if you were there (and maybe use your free hands to shovel popcorn into your mouth). Having to readjust every 15 minutes ruins the experience. It makes the headset more frustrating than enjoyable to use, and means you’ll probably just end up sticking it in a draw instead. So it’s very important that any headset you buy can be adjusted to fit well. This seems related to ‘good fit’ but isn’t actually the same thing. In fact, some of the headsets we tested were very comfortable when I wore them, but the poor fit made them impossible to watch anything on. Comfort is something that is absolutely crucial. If you get a headset that isn’t comfortable, there’s a chance you’ll use it for a couple of minutes at a time. But you’ll never be able to put it on and just relax. You’ll never be able to sit back and enjoy a 2 hour long film. Because uncomfortable headsets will push into your face, chafe your ears painfully, and all-in-all be much more trouble than they’re worth. Fortunately, testing for comfort is very easy. All we did was, put the headsets on and keep them on for a couple of hours. The headsets that were kind on our faces and didn’t itch scored well. The ones that did, went in the discard pile. When we talk about durability, we’re not just thinking about the headset itself. We’re also thinking about your phone. If you’ve got one of the latest iPhones, then it’s probably one of the more expensive bits of electronics you own. Some headsets just don’t hold your phone very securely. Thankfully, it’s never happened to me, but I’ve heard stories of phones falling out of headsets, and their screens cracking on the floor. So any headset you get needs to grip your phone securely. There should be no chance of it accidently coming loose while you’re gaming or watching movies. There’s also the concern about durability when it comes to the headset itself. While some of the cheaper models here are less durable than others (let’s just say they’re not exactly made out of titanium) they should all be tough enough that they won’t break if they fall of a table or something. Although with some of them you’ll need to be careful about sitting on them…. Virtual Reality is rapidly moving technology. While this can be said about all computing, it’s definitely more the case with VR as it’s a newly emerging field. In addition, VR Headsets are designed to go with phones. And in 2-3 years, you’ll probably have a different phone too. The point is, you probably don’t want to be spending a ton of money on a VR Headset right now. Just because the technology will be markedly better in a couple of years’ time. The VR enthusiasts we talked to, said that although they weren’t overly concerned about price, they probably wouldn’t be spending more than $100 on a VR Headset right now. So we made sure that all the headsets we recommend are (at the time of writing) under $100. When the headset users we surveyed talked about functionality, we initially weren’t entirely sure what they meant. It’s actually very simple though. What they mean is, how easy is the headset to use? And does it come with useful functions? For example, with some headsets, you put your phone in, turn it on, and start playing. If you want to pause your movie, you have to take it out and do it manually. If you want to rewind to a favorite bit, you have to take it out and do it manually. If you want skip a scene, well you get the idea…. So having the option to pause, or skip forward while wearing the headset is a huge advantage. This is actually very easy to do and it’s a wonder that more headsets don’t do it. Some models also have additional features, such as allowing you to take photos on your phone while still wearing the headset. So this is the kind of thing we mean by functionality. It was a pretty close race between this and our runner-up model. But overall, the Merge VR Headset came out on top. This model gives you one of the best immersion experiences you can get from an iPhone compatible headset. It stays securely in place while being worn and managed to fit the wide range of heads we tried it on too. It’s also the single most comfortable model we tried here. Which is a big deal when it comes to headsets. The reason it’s so comfortable, is because it’s made out of a soft rubbery material, which doesn’t push into your face. This is unlike most headsets, which tend to be made out of tough, brittle plastic. The difference when wearing this headset, is like night and day. Another benefit of the Merge being made of a soft rubber is durability. If you drop the majority of headsets, there’s a good chance they’ll crack, or at least scratch a good deal. But because the Merge is made out of rubber, if you drop it, it’ll just bounce. This makes it brilliant, particularly for kids who love playing with VR products and are often less careful than they should be. This durability extends to your phone too. Not only is your phone held securely in place (so it won’t fall out). But the soft rubber means there’s no chance of it picking up scratches while inside the headset. And even if you drop the headset with your phone inside, it’s got a flexible, rubbery cushion to protect it. At the time of writing, the Merge is the most expensive model to make it into our top 5. However, it’s well under our $100 limit and offers phenomenal value for money. It also offers excellent functionality, it comes with two triggers which you can use to pause and play any movies or games you’re playing. It’s got a removable screen out front (don’t worry it’s not big enough for your phone to fall through) that you can use to take photos on your phone’s camera with. There’s also a hole on the side of the Merge. So you can charge your phone or plug in headphones while using it. It’s simple, thoughtful things like this that make this headset so useable. And that’s the reason it’s number 1 on our list. We really liked the Hizek too. It’s a surprisingly tough and sturdy model. And despite the hard plastic, is actually just as comfortable to wear as the Merge. The Hizek comes with a set of earphones that are built-in to the model. These are nice, because they add an extra level of immersion that you can’t really get through speakers. However, you’ll need an adaptor in order to use them with the iPhone. Which obviously isn’t ideal. It comes with a strap that fits snuggly around your head. You adjust this into the ideal position for you and then secure it so it’s as tight as you like. It’s a durable model, and will look after your iPhone well. So it’ll put up with being sat-on or dropped. All-in-all we thought the Hizek was great. But the Merge definitely edges it out for iPhone functionality. We also liked the View-Master, which offers a nice (and slightly cheaper) alternative to our previous two headsets. The first thing to say about the View-Master is that it’s not overly complicated. But it does what it says on the tin. It fits well on your head (it didn’t slide about for any of us) and holds your phone securely too, so there’s not really any chance of it moving about inside. It’s a comfortable fit on your face, and is tough enough that you could definitely drop it without having to worry. Considering its price, I didn’t expect it to have very much functionality at all. But I was pleasantly surprised. While it doesn’t have the ability to take photos while still wearing it, you can pause movies through the use of a manual button that taps the screen. This may not seem like much, but I guarantee you’d miss this feature if you didn’t have it. However, overall this is an inexpensive introduction to VR. And for the price you can’t really grumble. This Pasonomi model is pretty good. It comes with a headband which does an excellent job of keeping it secured to your face. It’s also extremely durable (I accidently dropped it a couple of times, not even a scratch) and it’s pretty inexpensive too. However, around half of our staff just couldn’t seem to get comfortable with it. This wasn’t a problem for me, and I found that 20 seconds of adjusting made it fit snuggly on my face. But there were a couple of people in the office who had no problem with the other headsets, but just weren’t happy when wearing this model. We couldn’t exactly work out why. But that’s why it only made it to number 4 on our list. 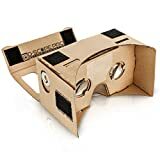 Last but certainly not least, we have probably the most famous budget virtual reality headset in the world today – The Google Cardboard. Now before we begin, this was the model of Cardboard we looked at, so we can’t vouch for any of the others. And there are tons. But if you fancy getting another version please do, just check the amazon reviews beforehand. The Cardboard is pretty brilliant, it’s certainly not the sturdiest model we’ve looked at, nor is it the most durable (although it does deal with being dropped very well). But it does the job just fine and produces nearly as good a VR experience as any of the others. Coupled with that, it costs very little. 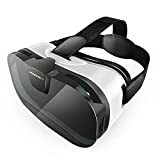 It’s less than half the price of the cheapest alternative on this list and as this model comes with straps, actually has more functionality than the View-Master we looked at earlier. Now, a lot of you are going to struggle to take this product seriously, and that’s up to you. It’s certainly easily broken, and isn’t going to last you too long. But considering how cheap it is, it’s a great entry point for VR for your iPhone. And personally, we think it’s great. Every headset we looked at here brings something to the table. And while we thought they were all pretty good, everyone felt that if given the choice, they would pick the Merge VR. It’s super-comfortable, extremely resilient, and allows you to pause and play midgame too. There are five key criteria to consider when buying the Best VR Headsets for iPhones. Find out what they are and read about our top picks this year.